It can take a lot of time and effort to complete much of the upkeep and improvements your home needs. Home improvements, renovations, and repairs need to be attended to frequently so that they remain up-to-date. Sears Handyman Services can help with most minor to intermediate home care needs. 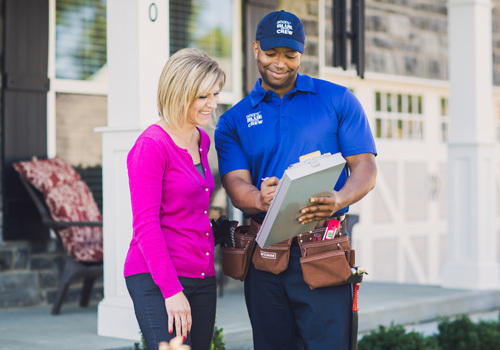 It's important to keep up with your home's maintenance, so why not hire a Sears handyman? We can help with various tasks, from plumbing to deck restorations and more. Give us a call at (516) 408-5500. Do you need recessed or LED lighting to be installed? Do your ceiling fans or other light fixtures need to be repaired or replaced? For these jobs and other electrical needs, you can trust Sears Handyman Services. Homeowners may not have the time or knowledge to complete minor electrical repairs on their own, which is where Sears Handyman Services can help. Mishaps can happen, and Sears Handyman Services are there to help when they do. Whether a window or window screen has been broken or leaves have built up in the gutters, Sears Handyman Services has the expertise to correct these mishaps and provide preventative maintenance to stop them from happening in the first place. Drywall is a common material used in construction today and most homes have some drywall elements. Homeowners have to be careful not to strike it with a hard object because, while sturdy, drywall is not indestructible. Simply hanging items can also lead to unappealing holes. Sears Handyman Services can quickly repair any damaged drywall or replace entire walls or sections of drywall. They are trained to patch, tape, repair, and hang drywall, so you don't have to. It takes a lot of work to maintain your deck for those luxurious summer days of barbecuing. If you have wood rot or water damage, Sears Handyman Services can help. They can prepare your deck to prevent water damage or build an entirely new deck. Take the stress out of your day and rely on one of our handymen. All these services and more are available from our capable and trustworthy employees. Identify your property line, close off your yard, or increase your privacy with an expertly installed new fence. Our handyman technicians can install a variety of fencing materials that are sure to increase the curb appeal of your home. Whether you are looking for a privacy or picket fence, or if you prefer a more economically friendly material such as chain link fencing, our technicians have the knowledge to install and repair a wide variety of fencing materials. Whether you want to rejuvenate your home with a fresh coat of paint or remove outdated wallpaper, the experts at Sears Handyman Services can help. Our technicians have the expertise to paint both interior and exterior surfaces. Spend time doing the things you love and leave the painting to us. Don't put yourself at risk climbing high ladders; let us reach those high areas for you and help get your home look its best.